The Great British Bake Off arrived the other day in our house with these gorgeous gift box biscuits from Biscuiteers. The attention to detail from the packaging to the biscuits themselves, well, it takes the biscuit! 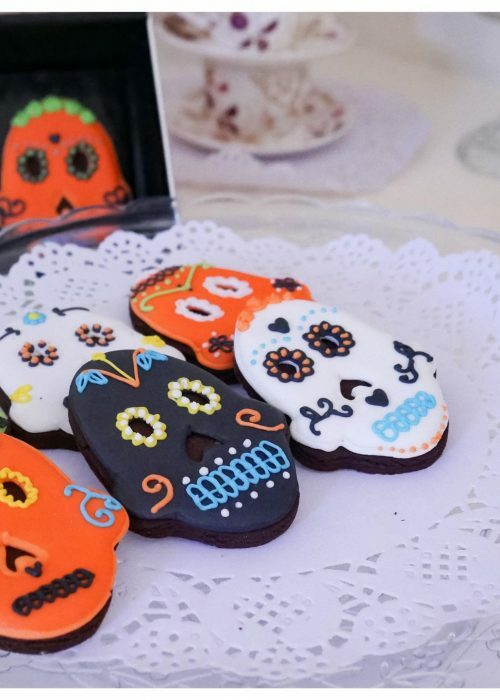 We decided to do a little early Day of the Dead tea party and it was a good excuse to learn a little more about the sugar skull traditions of Day of the Dead and also, scoff some yummy biscuits. So, it satisfies both the information and food sponge in me! Biscuiteers is a London based company, specialising in bespoke gift biscuits. They have some of their (not so standard) standard offerings, like thank you and get well soon biscuits. Then they have their super duper deluxe gift box tins and, yes they also do chocolates and cakes. I love looking for alternative gifts and I think I’ll do a whole post on all the different things I’ve found and gifted. These biscuits will definitely be in there. Honestly, I never thought I could call a box of biscuits beautiful, but there is no other way to describe them, from the minute you open the box, you know you’re in for a treat. That’s why they make such a thoughtful, alternative gift. From biscuit cards, to biscuit tins, to corporate tins, to their charity boxes, supporting Great Ormond Street and Dogs Trust and even pet boxes – there is literally something for everyone. When I say the packaging is great, I mean I even love the tin – you can never have too many pretty bits of storage and these ones make lovely display tins. If you like a nice button box, you could really store a lot of sewing accoutrement in there! Just kidding, well, kind of. But, you could use it for other sweet treats, too. The biscuits themselves are completely hand decorated. The level of skill leaves me astounded. Yes, they will be pinned on Pinterest as potential projects, but let’s face it, making them at home would be quite a feat for me and hey, that’s what Biscuiteers do, so for now, I’ll leave them to it! They even do classes at their School of Icing where you can take the kids, too! If London isn’t convenient, there’s always the Biscuiteers book of Iced biscuits to try at home. But, of course, you can just order online. The biscuits are packaged really well, so you have no need to worry about them breaking in the post. Order before 1pm for next day delivery. I love the fact that their ranges change seasonally and that there is literally something for every occasion. I wish I’d seen the wedding ones earlier for my sister’s wedding. So, in the tin, you get 12 really generous sized biscuits. They definitely don’t scrimp on the size! They are layered and stuck on with icing, so they won’t move or break before they reach their destination. And, as for the taste? Well, I have to say, I was reluctant to eat them as they look so good. BUT, in the interests of research, I took one (or two) for the team. The verdict? Delicious. And, they’re actually much lighter than I expected. Do judge a biscuit by its cover as these biscuits definitely do what they say on the tin. These ones come as a chocolate biscuit. I am one of those people who likes but doesn’t love chocolate (gasp!) so I’d love to have the choice of biscuit base, but that said, I found these biscuits really, really moreish! In case you’re wondering, the Day of the Dead biscuits aren’t gluten free, but Biscuiteers do have a whole range of gluten free biscuits. Of course! This Day of the Dead tin costs £39.50, so this is definitely one for a very special occasion. The ranges actually start from £6.00, so there are lots of options for every budget. Have you tried Biscuiteers biscuits before? What do you think of them as an alternative, bespoke gift? I really admire the people who ice these biscuits it is a lot harder than it looks and theirs are always perfect. The site is lovely too with plenty of hints and tips on trying to do it yourself. I am hoping to make the biscuit wreath off there.#nailedit. The biscuits look too good to eat. I love the colourful design. These look absolutely scrummy! I've heard whispers about Biscuiteers but I've never tried them. Will definitely be stopping by the bakery and sampling a couple.